Leo Binz was born in Stockton, Illinois in 1900. He was ordained a priest for the diocese of Rockford in 1924 and after being consecrated a bishop in 1942, he was Archbishop of Dubuque from 1954 until 1961, when he was reassigned to the Archdiocese of Saint Paul. He was installed as the fifth Archbishop on April 28th, 1962. Upon the completion of the Second Vatican Council in 1965, it became clear in the Archdiocese that Archbishop Binz was not swayed by popular opinion. Changes to the liturgy as stipulated by the Council were met with both acclaim and disfavor. He sought to faithfully and judiciously incorporate the teachings of Vatican II into his diocese. Taking a decidedly pastoral approach, Archbishop Binz promoted active lay participation and Christian renewal in the Church through fraternal societies, strengthening the Catholic Charities organization, as well as the continuation of the annual May Day rosary processions. In 1966, the name of the Archdiocese was officially changed to the Archdiocese of Saint Paul and Minneapolis to reflect the equal stature of the Twin Cities, as the Basilica of Saint Mary became the co-cathedral for the Archdiocese. As his health began to decline, Archbishop Binz’s request for a coadjutor was granted in 1967. From there on, he allowed coadjutor Archbishop Byrne to take greater control of the Archdiocese’s administrative affairs. 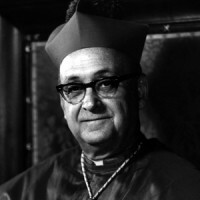 Archbishop Leo Binz died in Maywood, Illinois on October 9, 1979.